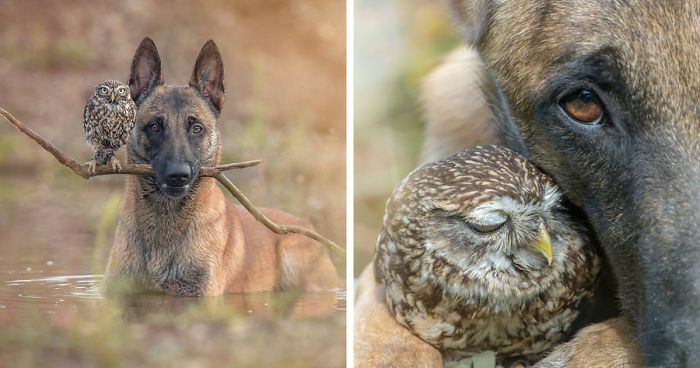 Ingo and friends are the members of Tanja Brandt's family who is an incredible animal photographer. These furry and feathered beauties are perfect models to portray beautiful, sweet and unexpected moments between two extremely different species. which animal does not love that? This is awesome and beautiful and precious. I am snowed in today in North Carolina and I really appreciate your pictures. I have loved animals too, all my life. Thanks again. The dog seems to smile!! So cute together! I have conquered you, beast. I am now your master. AWWWWW!!! His smile is so cute!! Ingo is totally smiling in this pic! Heck, they both are!!! This dog has more owl friends than I people friends. This looks like the Owl is riding into an epic battle on his trusty steed. Beautiful! Shh, were safe now!! I'll protect you, Ingo, no one will touch you! I can't live without you! Love This! Sleepovers are always better with a good friend. Owl: don't listen to those haters. Our love is pure. Let me deafen your ear to them. I'm just curious what those numbers are on his ear? No messin' wit my dog! I just love all these photos.. They're just so soft and gentle and far removed from the harshness of life.. This would make a great greeting card. Jeee, I'm so in love with Belgium shepherds (Mechelen)... it's unconditional. I really can NOT get enough of that dogface... and those wonderful owls. Owl always be there for you big guy. Can I snuggle with you? I sleep at night! Well, I don't! what are we looking for - dinner? I see the future. It holds more snuggles. Wow!!! The lighting is perfect, It brings Ingo into such a beautiful soft focus. And it makes the owl look almost ethereal. Gorgeous Shot!!! When you gotta sleep you just have to shut those eyes! Well one mushroom to share for dinner. Golly gosh what on earth! 2 X Lord of ( in) the ring!